If you missed the fun that night, you’re in luck. Electronic Damask has already been tapped for another show, and with an opening tonight in Pilsen, from 6 – 10pm. This show should be of particular interest to PS1 members. It’s called Technologic and it “celebrates making art through technology”. It features some amazing stuff made with 3D printers, LCD screens, CNC watercolor painting, and of course a certain knitted e-textile. The gallery, Chicago Art Department, is located at 1932 W Halsted in East Pilsen’s Chicago Art District (#8 Halsted bus runs right past it). Tonight’s opening coincides with the district’s 2nd Fridays gallery night, so there will be other openings all over the neighborhood. You can find preview photos of the show on the facebook page. Full info is below. The show runs until December 6. An exhibition that celebrates making art through technology. Work featured will include robotic drawing, 3D printing, laser cutting, textile circuitry, algorithmic art, image slicing, circuit bending, and prosthetics. Although often unsung – artists having access to new technologies has historically pushed and propelled creative endeavors. The exciting new technologies of today have been pushing the overall culture of DIY and propelling the Maker Movement. This is a participatory culture that embraces tools and empowers masses of people to innovate and create. Technologic explores and showcases not only how art is currently being produced with new tools, but how fringe technologies can be used in progressive and cutting edge ways. Viewers also have an opportunity to “go deeper” to gain further insight through series of discussions and workshops as well information on the processes at the exhibit. 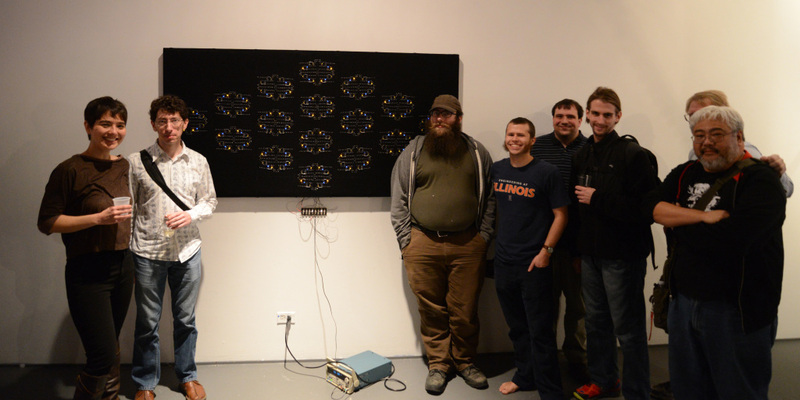 Technologic is curated by Chuck Przybyl for Chicago Art Department.